Probabilistic Methods for Bioinformatics Neapolitan Richard E.
Add to cart the livre of Neapolitan Richard E.
The Bayesian network is one of the most important architectures for representing and reasoning with multivariate probability distributions. When used in conjunction with specialized informatics, possibilities of real-world applications are achieved. 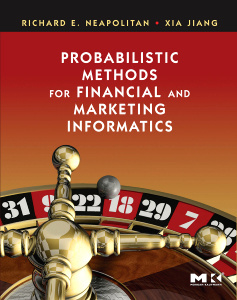 Probabilistic Methods for BioInformatics explains the application of probability and statistics, in particular Bayesian networks, to genetics. This book provides background material on probability, statistics, and genetics, and then moves on to discuss Bayesian networks and applications to bioinformatics. Rather than getting bogged down in proofs and algorithms, probabilistic methods used for biological information and Bayesian networks are explained in an accessible way using applications and case studies. The many useful applications of Bayesian networks that have been developed in the past 10 years are discussed. Forming a review of all the significant work in the field that will arguably become the most prevalent method in biological data analysis. Unique coverage of probabilistic reasoning methods applied to bioinformatics data--those methods that are likely to become the standard analysis tools for bioinformatics. Complete review of Bayesian networks and probabilistic methods with a practical approach. This book is for all R&D professionals and students who are involved with industrial informatics, that is, applying the methodologies of computer science and engineering to biological information. This includes Computer Science and other professionals in the data management and data mining field whose interests are bioinformatics in general, and who want to apply AI and probabilistic methods to their problems--in order to better make predictions about the data. For instance, suppose you have long homologous DNA sequences from the human, the chimpanzee, the gorilla, the orangutan, and the rhesus monkey. One can use the methologies from informatics to obtain new information about which species is most closely related to the human.